The 2014-2015 NBA season has finally gotten underway. Along with millions of others fans, I've sat patiently waiting for my team to get the first game of the season under their belts.This season is going to be tough for us Lakers fans and if that wasn't bad enough we lost our Rookie, Julius Randle for the season with a broken tibia. Sigh. But Enough chatter about that, I wanted this to be a positive/funny post so let me get to that. 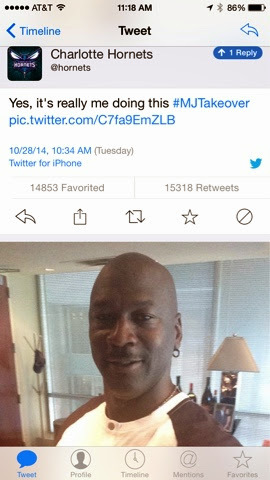 A few days ago Michael Jordan took over the Charlotte Hornets Twitter account. At first I was skeptical because I never thought M.J. would do such a thing and actually be hands on about it. Boy was I wrong. From the first tweet to the last, Jordan literally broke Twitter and he did it within the first few minutes. First, he really made sure that everyone knew and understood that he was actually behind the tweeting. But what he did next just made everyone cry. 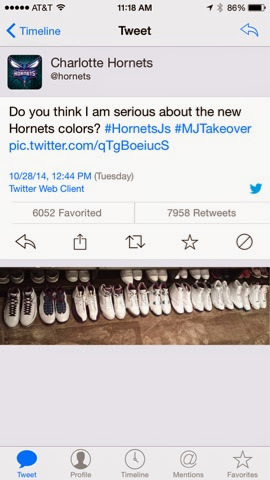 Michael tweeted a picture of a row of Air Jordan sneakers all blessed with the Charlotte color way. For a clearer picture please click on the image below. Sneakers heads and Basketball fans alike went crazy. To me it wasn't because of the shoes themselves, but there's something so awesome about really famous people using social networks. Especially someone as huge as Michael Jordan. It was truly an awesome day. It's the little things that count.